Overall, this is an appealing work for students and professionals, and is certain to remain as one of the key works in natural resource analysis. Biological renewable resources, essential to the survival of mankind, are increasingly overexploited by individuals and corporations that often sacrifice long-term economic health and sustainability for short-term gains. 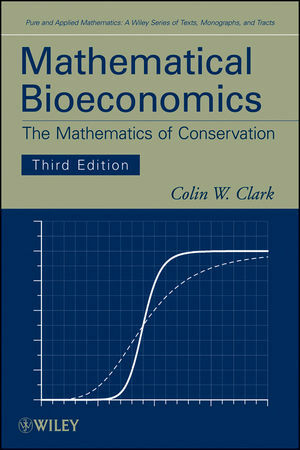 Mathematical Bioeconomics: The Mathematics of Conservation, Third Edition analyzes the economic forces underlying these misuses of renewable resources and discusses more effective methods of resource management. Promoting a complete understanding of general principles, the book allows readers to discover how rigorous mathematical models that incorporate both economic and biological factors should replace intuitive arguments for conservation and sustainability. Fundamental concepts of population dynamics and economics are utilized throughout the book while mathematical techniques are incorporated in an accessible manner. Relevant data from current research sheds light on the presented material, and exercises provide readers with an opportunity to test comprehension of discussed mathematical methods and techniques. Continuing to provide a complete and modernized presentation of the fundamental principles of the topic, Mathematical Bioeconomics, Third Edition is an excellent book for courses on applied mathematics, resource management, and environmental studies at the upper-undergraduate and graduate levels. It also serves as an insightful reference for resource managers, ecologists, biologists, and other professionals who work to improve the management of renewable resources and develop sustainable practices in the environmental sciences. Colin W. Clark, PhD, is Professor Emeritus at the University if British Columbia (Canada). Throughout his career, he has collaborated with biologists and economists in model construction and application. A Fellow of the Royal Society of Canada and the Royal Society of London, Dr. Clark has published extensively in his areas of research interest, which include behavioral ecology and the economics of natural resources with an emphasis on commercial fisheries. 1 A Generic Bioeconomic Model. 1.3 A Dynamic Resource-Harvesting Model. 1.5 A Dynamic Optimization Model. 1.6 A Model of Individual Behavior. 1.8 The Veil of Uncertainty. 2.2 Optimal Control Theory in One Dimension. 3.6 Competition, Cooperation, and the Theory of Games. 3.7 The Economics of Uncertainty. 4 Investing in Harvesting Capacity. 4.2 Investment Decisions under Competition. 5 Regulation of Renewable Resource Harvesting. 5.1 The Consequences of Unregulated Resource Harvesting. 5.2 Methods of Regulating Resource Harvesting. 5.3 Shadow Prices, Taxes and Tradeable Quotas. 5.4 Regulation without Taxes or Tradeable Quotas. 6.2 Fisheries: The Cohort Model. 7 Resource Management under Uncertainty. 7.1 Process and Observational Uncertainty. 7.4 An Introduction to Decision Analysis.